Vijay Deverakonda is an Indian film actor known for his works in Telugu cinema. Vijay made his film debut in 2011 with Ravi Babu's romantic comedy Nuvvila (2011), but he gained recognition with his supporting role in the coming-of-age drama Yevade Subramanyam (2015). Vijay gained stardom by playing the lead role in the 2016 blockbuster romantic comedy Pelli Choopulu, which won the National Film Award for Best Feature Film in Telugu and the Filmfare Award for Best Film - Telugu. Vijay has established himself as a leading actor of Telugu cinema by starring in lead roles in critical and commercial successes such as Arjun Reddy (2017), Mahanati (2018), Geetha Govindam (2018), and Taxiwaala (2018), some of which rank among the list of highest-grossing Telugu films. His performance in Arjun Reddy won him several accolades, including the Filmfare Award for Best Actor - Telugu. Vijay Deverakonda was born to Telugu television director, Deverakonda Govardhan Rao and Deverakonda Madhavi in Achampet, Nagarkurnool district of Telangana. Deverakonda made his film debut by starring in Ravi Babu's romantic comedy Nuvvila in 2011, and then had a small cameo role in Sekhar Kammula's Life is Beautiful. Both films were decently successful but failed to give Deverakonda much recognition. Then, he was introduced to an assistant director at the time, Nag Ashwin, who later cast him in a supporting role for the 2015 movie Yevade Subramanyam alongside actor Nani. The film was produced by the daughters of Ashwini Dutt, a producer in the Telugu film industry. Priyanka Dutt backed him, and once shooting started, Swapna Dutt signed him onto her company. The film went on to be a critical and commercial success, and Deverakonda won high praise for his diction, energy, and role in the movie. This movie finally gave him a much-desired break in Telugu cinema. Vijay's first lead role was in Pelli Choopulu, a romantic coming-of-age entertainer directed by Tharun Bhascker Dhaassyam, with Ritu Varma as the female lead. The film went on to be commercially successful and won the Best Feature Film in Telugu[disputed – discuss] at the 64th National Film Awards as well as the Filmfare Award for Best Film - Telugu. He received praise for his realistic portrayal of a lazy and unmotivated chef. He then starred in a masala entertainer, Dwaraka in 2017. It opened to mixed to negative reviews and flopped at the box office. His next film Arjun Reddy received praise and criticism alike for being very bold and radical. Vijay's portrayal as a self-destructive, short-tempered, and alcoholic surgeon received critical acclaim, which led to him winning numerous awards, including the Filmfare Award for Best Actor - Telugu. Following Arjun Reddy was Ye Mantram Vesave, which was delayed for 5 years and finally released. It was given poor reviews from critics and could not fare well at the box office. He then starred in Mahanati, a biographical period film around life of actress Savitri. He won acclaim for playing a charismatic and easy going photographer. Deverakonda's next release in 2018 was Geetha Arts' romantic comedy Geetha Govindam, in which he starred as an innocent and nervous college professor. Deverakonda received praise for playing a subtle, boy-next-door character after an aggressive role in Arjun Reddy. The film went on to become a triple blockbuster at the box office, having only been made on a budget of 5 crores. His next film, released on October 5, was the political thriller NOTA, directed by Iru Mugan-fame Anand Shankar. It received mixed reviews from critics and ended up as a disaster at the box office. His next project was UV Creations' supernatural comedy thriller Taxiwala in which Vijay stumbles upon a possessed car opposite Malavika Nair. As of November 2018, Vijay is currently filming for Dear Comrade a sports drama once again alongside Rashmika Mandanna and another untitled Kranthi Madhav's romantic drama opposite Rashi Khanna, Aishwarya Rajesh and Izabelle Leite. Vijay placed 72nd in the reputed Forbes India celebrity 100 list 2018. • All the films are in Telugu language, unless otherwise noted. 2018 Ye Mantram Vesave Nikhil "Nikki"
^ Shalini J. R. (9 May 2018). "Vijay Deverakonda celebrates his birth in a unique way". The Times of India. Retrieved 3 January 2019. ^ "'This film came at the right time'". thehindu.com. Retrieved 30 August 2017. ^ "Serial kisser Deverakonda is the Emraan Hashmi of Telugu cinema". ^ Vyjayanthi Network (15 January 2015). "Yevade Subramanyam Theatrical Trailer - Nani, Malavika Nair". Retrieved 30 August 2017 – via YouTube. ^ "NDTV Movies: Regional-Movies - Tamil Movies - Telugu Movies - Bengali Movies - Latest Movie News - Celebrity Gossip". movies.ndtv.com. Retrieved 30 August 2017. ^ "An eye for story". thehindu.com. Retrieved 30 August 2017. ^ Vyjayanthi Network (21 February 2015). "Swapna Dutt Speech - Yevade Subramanyam Audio Launch Live - Nani, Malavika Nair". Retrieved 30 August 2017 – via YouTube. ^ Radiokhushi. "'Evade Subramanyam' says Nani". www.radiokhushi.com. Retrieved 30 August 2017. ^ "The Times Group". epaperbeta.timesofindia.com. Retrieved 30 August 2017. ^ "Women's groups protest against 'Arjun Reddy' in Vijayawada, demand ban on film's screening". The News Minute. 1 September 2017. Retrieved 3 September 2017. ^ "Arjun Reddy movie review: Intense, raw and unbelievably honest. 5 stars". Hindustan Times. 26 August 2017. Retrieved 27 August 2017. ^ "'NOTA' Worldwide Closing Collections - Disaster". Telugu360.com. 27 October 2018. Retrieved 28 October 2018. ^ "Winners list of Behindwoods Gold Medal Awards 2018". 17 June 2018. 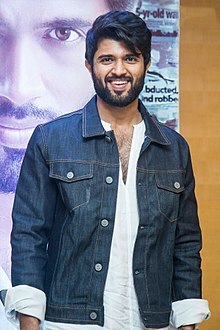 Wikimedia Commons has media related to Vijay Devarakonda.